Welcome to Santa Barbara Baking Company! 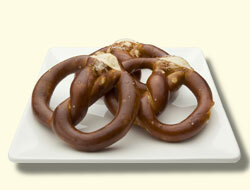 Our pretzels are individually formed by hand using a traditional recipe from the southern part of Germany. Because they are pre-baked, we recommend that you store them in your freezer. Then, when you are ready to enjoy one, spray it lightly with water and apply the salt. 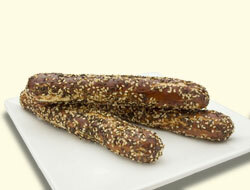 Bake 3-5 minutes at 375 F for a healthy, low-fat snack.